Every homeowner envisions warm holiday dinners around the dinner table. Maybe you picture your kids doing homework on it too, or you long to use it as a place to do your hobbies. In all these visions, the perfect dining room table provides the setting. Finding that table, though, can be more of a challenge than you expect. Check out these tips before your shop for a dining room table. You’d be surprised how often people are shopping and say, “This color is the perfect match for our dining room!” Then they get home and realize the colors are just off enough to clash. Before you shop, take a well-lit photo of your dining room. It can help to get a few different angles. 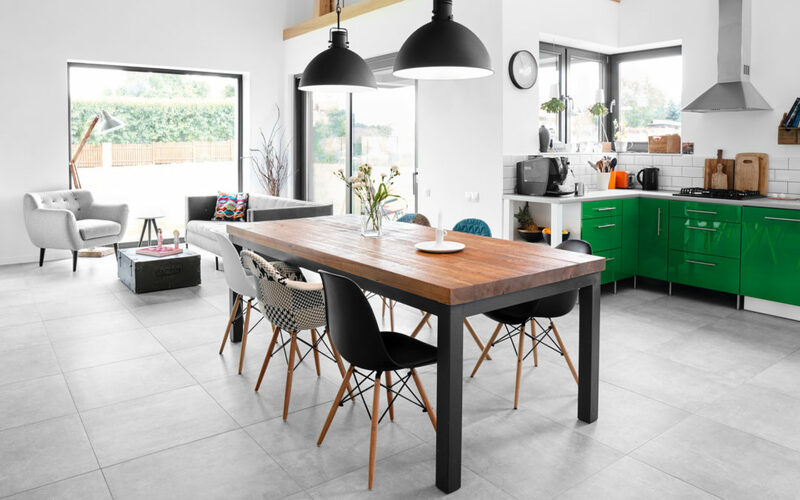 If you want a stylish table, read up on the latest dining room table trends before you go shopping. For example, reclaimed wood is all over the dining room furniture scene, as are high texture and dark wood. Imagine the nightmare of buying a dining table and then finding out it’s too big for your dining room. The same is true if you buy a table that’s too small for your entire family to fit around with comfort. There are a few rules you need to know. First, figure out how many people you want to seat. For a comfortable dinner, you’ll want to allow a space that’s 30 inches wide and 18 inches deep for each diner. Make sure you have six inches or so of space in the middle as well for dishes. You also need to measure your dining room. The rule of thumb is that you want 36 inches around each side of the table. Don’t forget to account for other furniture as well. If you have a sideboard against one wall, for instance, measure from the front of the sideboard, not from the wall. Dining room tables come in plenty of shapes. The shape of your table should reflect the shape of your room. If your dining space is square, get a table that’s square or round. If the dining area is a rectangle, your table should be an oval or a rectangle. If you want your dining room table to last, quality is a must. Looking for American-made furniture makes it easier for you to find a high-quality table. Of course, it has the added bonus of supporting our local economy. Some dining room tables are easier to maintain and clean than others. As you narrow your search to a few options, ask about table care to make sure it’s manageable. For example, a glass table might not be a good fit for a family with kids and/or pets because it smudges in a hurry. Your dining room table will be the backdrop for countless dinners and events. If you find the right one, it gives your dining room the perfect style while also being a long-lasting fixture. Now that you’re ready to start shopping, find out more about our quality furniture store.